Pretty Little Liars review: What’s the rush? Everyone seems to be in a rush this week on Pretty Little Liars and that’s the perfect time to make mistakes. Are the Liars heading for even more trouble? On “Close Encounters,” everybody was moving so fast it was making my head spin. Decisions take time, so why was everyone rushing? Oh, yeah, feelings! Those pesky feelings were definitely the catalyst. Mr. Hastings finds Spencer at Toby’s. He went to see Toby about Radley, but tells her that Jason fell off the wagon and that’s why he’s been meeting with Mrs. D.
Aria tells Ezra she’ll be breaking things off with Jake because Ezra’s the one and he always has been. Ali sent Shana to warn the Liars off of trying to find her because they almost got her killed. Shana says she’s known Ali longer than they ever knew, but the Liars think it’s an A trick. Hanna starts moving very fast with Travis, but he puts a stop to it just before her mother comes in to do the same. Emily meets with Ali and is about to tell her something about A when Spencer shows up and Ali flees. Spencer tells Emily Ali knew she was pulling away and that’s why she sucked her back in. As a rule, Pretty Little Liars is usually pretty full of exciting mysteries and reveals, but the show has held to the promise they’ve made to pick up the pace for the second half of Season 4 and every week feels a bit more frantic than the last. Last week Toby was excited at the prospect of what might be done to Radley because of the information he and Spencer uncovered, and this week Mr. Hastings said there wasn’t enough evidence to close the place down, so they were offering a settlement and, just like that, Toby signed the settlement. Spencer discovered that it meant never talking about it again, and since Mrs. DiLaurentis is on the board, she suspected her dad of nefarious reasons for making the deal. She wanted Toby to wait, but he and his father just want to move on. Not everyone wants to hold onto pain and drown themselves in it like Spencer. Could this be a tear starting in their relationship? Spencer was also concerned about Emily because of the meeting Em had with Shana. Shana has been in contact with Ali since Mona was in Radley. She’s known all this time that she was alive and has been playing double agent. Honestly, haven’t they all? Now we’re supposed to believe Shana has been playing best friend to Jenna to get information for Ali because she was a top suspect as A. Paige is on that list now, too. Emily did meet with Ali and Ali was scared out of her mind. She’s always seemed like a great actress, but this did seem sincere. On the other hand, Spencer had a great point as well. What if Ali could feel Emily pulling away and needed to reel her back in by proving to her she was beloved and trusted? It’s the perfect way to tear them all apart again and keep them in constant turmoil. I really wish the Liars would pay another visit to their counterparts in the neighboring town to hear their point of view and how their friend had them trapped by her lies and was able to make them feel so small and in need of her approval to feel worthwhile. It’s so artificial, and part of me believes that’s what Ali is doing. Hanna was in a free fall after losing Caleb and doubting everything about herself, right down to her amazing wardrobe. She cleaned out her closet and made a move on Travis — a move that wasn’t reciprocated. It wasn’t because he didn’t want her, but because he wanted her to be right with things. She pushed it and, thankfully, Ashley interrupted before she made a mistake she couldn’t take back. Hanna’s phone call later to Caleb proved she wasn’t ready to move on but had some things she needed to get off of her chest. Worst of all was Aria getting back together with Ezra. Not only did I hate the dress she was wearing because I had pajamas in the same pattern 15 years ago, but letting Jake go is a horrible move. I wish he had been able to paint a better picture of what he saw Ezra doing to the car, because it most certainly was violent. What woman wouldn’t be frightened if a man was pounding on her car? What was once a sweet, if disgusting (based on the teacher/student aspect), relationship is now ugly. When Ezra reaches down to kiss Aria, it’s very unpleasant. Did Ezra recruit Mona onto his A team already, or does he have others working with him? He obviously put the knives into Jake’s punching bag, but who tore and burned Shana’s photo if he was busily kissing Aria? The previews show Mona and Ezra are connected somehow. They must be working together now. I should have known she wasn’t to be trusted. What did you think of this installment, and why do you think everyone was moving so fast? They barely had time to breathe before jumping. 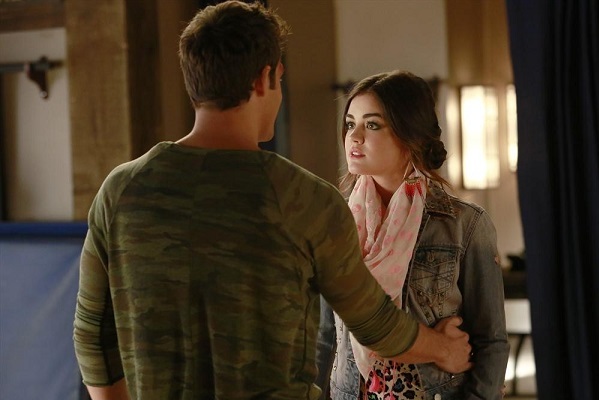 If A is unmasked, can a new mystery be introduced that will be as thrilling?